Passive House was an unknown concept to the two visual artists who approached Leonard Wyeth, principal of Wyeth Architects LLC, seeking a new house with a pair of studios for their property in Stonington, Connecticut. Once he explained its many benefits, ‘That fits the bill” was their response. The clients’ new 1,850-ft2 house overlooks a tidal salt marsh and includes two detached studios located to the north of the house, outside the Passive House envelope. It’s in an area near Long Island Sound that is prone to hurricanes, so this single-story house is constructed to withstand the elements, while also opening up to expansive views of the surrounding marshland. “The biggest design challenge was the orientation of the site. It is narrow—runs north to south—with views to the east and the southern edge of the property. The land to the south belongs to the state and is a protected forest,” says Wyeth. To capitalize on the light and views, openings on the east and west sides were increased using glass with a solar heat gain coefficient of .51 to mitigate solar gain. Morning light floods the structure, just as the clients wanted, while deep overhangs block direct heat in summer. A tinted-glass overhang protects the west elevation, while the views to the east are washed in afternoon sunlight reflecting off the marsh. Combining hurricane resistance and Passive House superinsulated assemblies required the Wyeth team to develop some innovative solutions. They started with a double-wall assembly whose outer wall is bolted tightly to the concrete foundation and slab. The windows are fitted for fabric hurricane shades for extreme weather events. The thick double walls are filled with dense-packed cellulose. 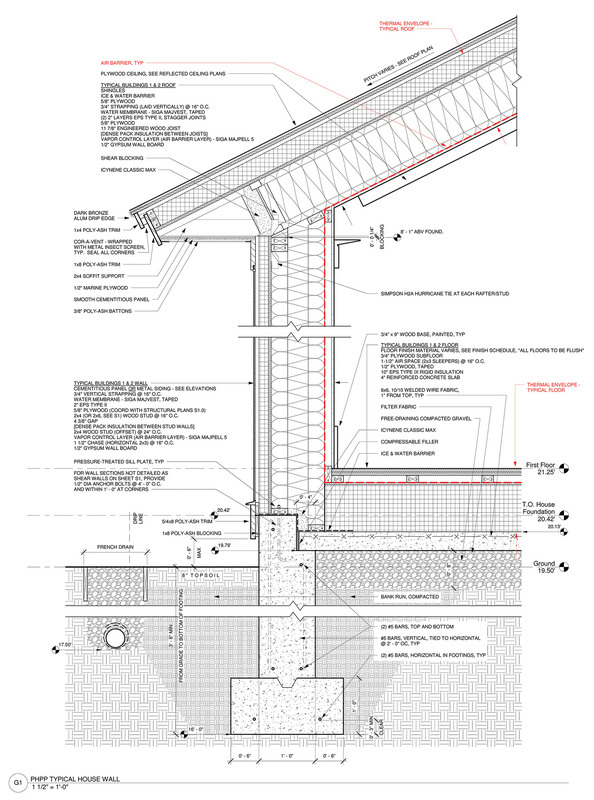 Two inches of EPS insulate the exterior of the outer wall, and 10 inches of EPS were installed on top of the slab, creating a wall-to-floor connection that is thermal-bridge-free. An air barrier was installed to the interior of the insulation, followed by a 1.5-inch service cavity to allow wire to travel everywhere while eliminating penetrations of the air barrier. The palette of materials used throughout the exterior was selected for minimal long-term maintenance, including weathering-steel siding, cement board siding, poly-ash trim, and composite decking. The expanse of glass to the east and west (for views) required special tints and films to control heat gain and loss. Layers of safety plate were included in the windows, both for strength and for their ability to filter out ultraviolet light—protecting the works of art within. The interior material selections reflect the artist clients’ personal visions. Combinations of industrial and natural appear throughout. Discarded framing and doors from the clients’ former farmhouse were reused or reimagined as counters or shelving. Boulders dug up during site excavation were cut for flooring tiles and paving slabs for exterior walkways. Working closely with Passive House consultant David White at Right Environments and mechanical engineer Russell Knuth at Consulting Engineering Services yielded a whole-building approach to the systems. Heating and cooling are provided by an air-to-air heat pump with separate controls so that each resident artist can control their individual comfort level. Another heat pump delivers hot water. An independently ducted ERV system brings fresh air into the building. The 24-panel PV, roughly 6-kW, array is projected to bring the three buildings to net zero. It is generously sized to compensate for the energy-intensive equipment in the artists’ studios. The studios are designed to a high level of insulation, but not to Passive House. They operate independently on their own air-to-air heat pump system. The all-electric building includes indusction cooking and a very efficient heat pump dryer, along with a decorative closed-system gas fireplace. Despite the innovative Passive House approach, the building preserves a New England aesthetic, with a pitched roof covered in fiberglass shingles and a cozy screened-in porch. The owners have discovered a new level of comfort that they had not expected. Their past lives had involved wonderful old drafty farmhouses and tiny cottages by the sea. Their initial reaction to their new Passive House was a deep appreciation of the comfort level of the uniform heat in the winter and cooling in the summer. The absence of dust, allergens, and stale air was another pleasant surprise. The mechanical systems are essentially silent. The sound of the Amtrak rail line in the distance was gone; in fact, the silence itself was also a welcome surprise.